Medium: Digital, Shopping bag, Note, Coaster, File. Traditional department store Tobu wants to rejuvenate its aging customers and refresh its recognized image of a ‘department store for the elderly’. Recently, it has been pushed by other department stores with younger customers and momentum. Tobu desperately needed a campaign that creates buzz. The department store wanted to roll out 2013 Christmas campaign with a refreshing look to seed a new image of the store and to drive sales and acquire new customers. 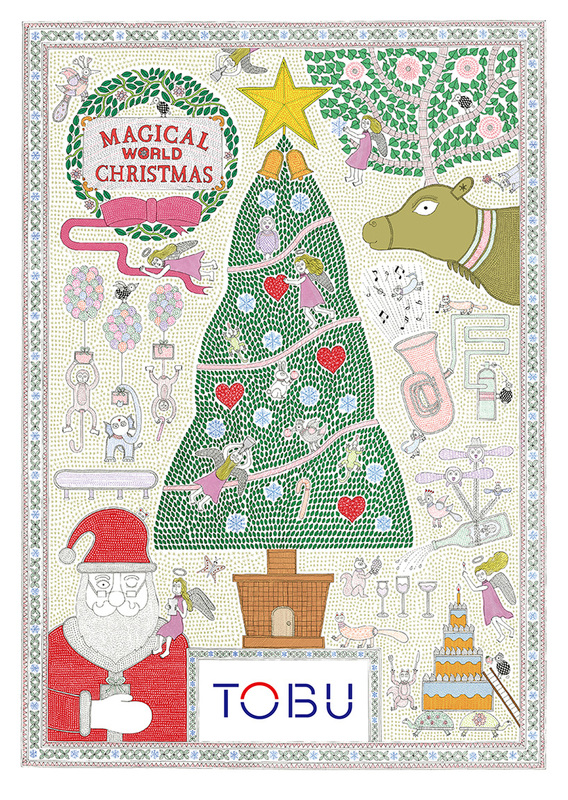 Angels and fun animals are lightheartedly preparing for the exciting, magical Christmas. The illustration is drawn with fine, precise lines with attention to detail. This intriguing fantasy piece of illustration intends to vibrantly express fun and excitement of Christmas. Successfully refreshed the image of Tobu. This Christmas campaign gained huge attention of and positive reputations by consumers, many asking the department store how they could get the poster. The campaign has created most proactive and positive comments for Tobu in its history. *Due to its policy, Tobu does not release its sales numbers.